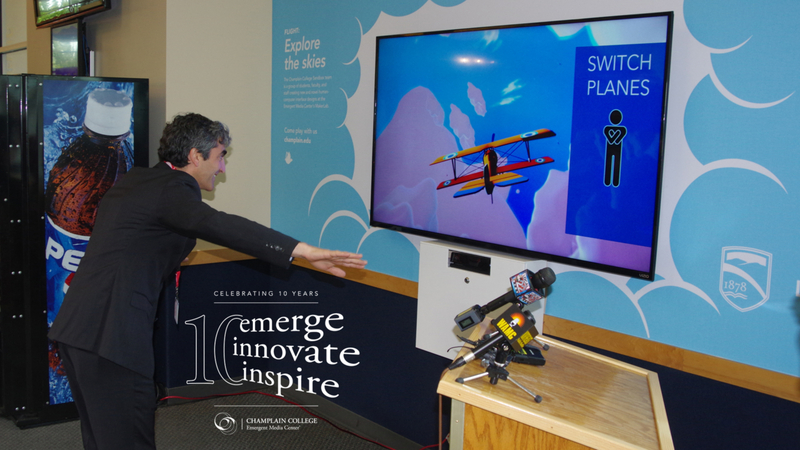 SOUTH BURLINGTON, Vt. – A nearly year-long collaboration between Burlington International Airport and the Champlain College Emergent Media Center’s Sandbox Team culminated last week with the launch of two interactive art installations. “People drive by Champlain College, say it’s a beautiful campus, but no one is really sure what is going on behind those walls. [BTV Aviation Director Gene Richards] walked through and said we need to replicate what’s going on behind those walls at the airport.”, said Champlain College Senior Vice President David Provost. Burlington Mayor Miro Weinberger, Champlain College President Don Laackman and various media outlets were among a large crowd on-hand to experience the first official demonstrations of Flight and Graffiniti. “This is a city of innovation. That innovation runs through everything we do.”, said Weinberger. Before hopping on REAL airplanes, passengers engaging with Flight become VIRTUAL airplanes thanks to the exhibit’s motion sensing input devices. Players hold their arms out to dip, dive and lean their way through a video-generated sky. Not to be outdone, Graffiniti also utilizes motion-sensor technology to let users electronically paint works of art. One hand controls the movement and size of the paintbrush while the other toggles between various colors. “It’s designed to be interactive, to engage people in a very natural way, and we believe it embodies much of the education, the radically pragmatic education, that takes place at Champlain College.”, said Champlain College President Don Laackman. Partnerships like the one between the Emergent Media Center and Burlington International have become a staple of the EMC, and have given students a chance to gain real-world experience. “I’m working on stuff that people in my industry wish they could be working on, and I’m doing it as a college student.”, said Keats. For more information about the Champlain College Emergent Media Center’s effort to “Emerge. Innovate. Inspire.”, and to join the celebration of the EMC’s 10th anniversary… visit ten.emergentmediacenter.com or email emc@champlain.edu.